Camila AwardIshueva (Mentor: Paul Malchow) was awarded a 2018 Honors College Research Award. Taylor Cairns (Mentor: Peter Okkema) was awarded the 2018 Louis Pasteur Award. Alex Chu (Mentor: John Larson) and Thomas Dagenais (Mentor: Peter Okkema) received the Chancellor’s Undergraduate Research Award. Chioma Onoh (Mentor: Thomas Park) participated in the the Summer Research Opportunities Program. 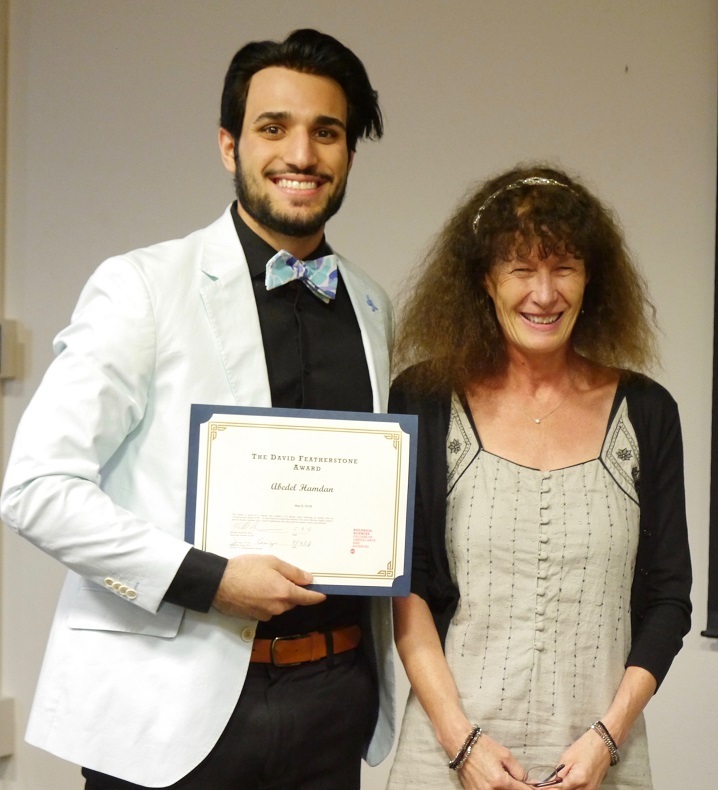 Usama Malkana (Mentor: Ankur Saxena) placed first in the UIC Student Research Forum Poster Competition (Life Sciences). Jocelyn Garcia (Mentor: Ankur Saxena) received the 2017 Chancellor’s Undergraduate Research Award. Daniel Koshy (Mentor: Ankur Saxena) received a 2017 Honors College Research Grant. Estefania Zarate (Mentor: Stephanie Cologna) was a L@S GANAS Fellow and recipient of the Chancellor’s Undergraduate Research Award. Dylan Tabang (Mentor: Stephanie Cologna) received the Honors College Research Award, Honors College Travel Award and Edward G. Reitz Award for an Outstanding Graduating Senior. Chandimal Pathmasiri (Mentor: Stephanie Cologna) was accepted to and received a travel award for the May Institute on Computation and Statistics for Mass Spectrometry and Proteomics. Given to an outstanding graduating neuroscience major with a GPA above 3.7 and who performed an exceptional research project. The awardee is selected by an undergraduate program committee and will receive a $500 honorarium on Awards Day. Given to a student who has completed an exceptional research project with a focus on systems and behavioral neuroscience and who has a GPA of 3.2 or higher. The awardee is selected by an undergraduate program committee and will receive a $250 honorarium on Awards Day. $250 honorarium on Awards Day. Winning video by Abedel Hamdan for the Featherstone Award! Given to a student who crafts a 2-3 minute video reflecting on his/her time as a neuroscience major at UIC. This award honors the memory of Dr. David Featherstone, an out-of-the-box, highly creative and fun faculty member. The video needed to be creative, quirky and spirited! The student who makes the video judged to be the best will receive a $250 honorarium on Awards Day.